Arbitrage is the strategy of taking advantage of price differences in different markets for the same assetTypes of AssetsCommon types of assets include: current, non-current, physical, intangible, operating and non-operating. Correctly identifying and classifying the types of assets is critical to the survival of a company, specifically its solvency and risk. An asset is a resource controlled by a company which future economic benefit. For it to take place, there must be a situation of at least two equivalent assets with differing prices. In essence, arbitrage is a situation where a traderThe Winning Mindset of a TraderBeing a master trader is not just about formulating better strategies and analysis but is also about developing a winning mindset. Traders have important psychological skills that give them a distinct trading edge. can profit from the imbalance of asset prices in different marketsTypes of Markets - Dealers, Brokers, ExchangesMarkets include brokers, dealers, and exchange markets. Each market operates under different trading mechanisms, which affect liquidity and control. The different types of markets allow for different trading characteristics, outlined in this guide. The simplest form of arbitrage is purchasing an asset in the market where the price is lower and simultaneously selling the asset in the market where the asset’s price is higher. Arbitrage is a widely used trading strategy, and probably one of the oldest trading strategies to exist. TradersSales and Trading Salary GuideIn this sales and trading salary guide, we cover jobs in the sales and trading sector and their corresponding average salaries for 2018. Sales and trading are among the primary functions of an investment bank. who engage in the strategy are called arbitrageurs. The concept is closely related to the market efficiency theoryEfficient Markets HypothesisThe Efficient Markets Hypothesis is an investment theory primarily derived from concepts attributed to Eugene Fama's research work as detailed in his 1970 book, "Efficient Capital Markets: A Review of Theory and Empirical Work".. The theory states that for markets to be perfectly efficient, there must be no arbitrage opportunities – all equivalent assets should converge to the same price. The convergence of the prices in different markets measures market efficiency. Both the Capital Asset Pricing Model (CAPM)Capital Asset Pricing Model (CAPM)The Capital Asset Pricing Model (CAPM) is a model that describes the relationship between expected return and risk of a security. CAPM formula shows the return of a security is equal to the risk-free return plus a risk premium, based on the beta of that security and the Arbitrage Pricing TheoryArbitrage Pricing TheoryThe Arbitrage Pricing Theory (APT) is a theory of asset pricing that holds that an asset’s returns can be forecast using the linear relationship between the asset’s expected return and a number of macroeconomic factors that affect the asset's risk. This theory was created in 1976 by the economist, Stephen Ross. explain that arbitrage opportunities occur due to the mispricing of assets. If the opportunities are fully explored, the prices of equivalent assets should converge. Warren Buffett at 6 years old saw that he could profit from arbitrage. He would purchase a 6-pack of Coca-Cola for 25¢ and sell each bottle for 5¢ in his neighborhood, profiting 5¢ per pack. Young Warren Buffett saw that he could profit from the difference in the price of a six-pack versus what people were willing to pay for a single bottle. A very common example of arbitrage opportunities is with cross-border listed companies. Let’s say an individual owns stock in Company ABC, listed on Canada’s TSX, that is trading at $10.00 CAD. At the same time, the ABC stock listed on the NYSE trades at $8.00 USD. The current CAD/USD exchange rate is 1.10. A trader could purchase shares on the NYSE for $8.00 USD and sell shares on the TSX for $10.00 CAD. This would give him a profit of $1.09 USD per share. In different markets, the same asset is traded at different prices. Assets with similar cash flowsCash FlowCash Flow (CF) is the increase or decrease in the amount of money a business, institution, or individual has. In finance, the term is used to describe the amount of cash (currency) that is generated or consumed in a given time period. There are many types of CF are traded at different prices. An asset with a known future price currently traded at a price different from the expected valueExpected ReturnThe expected return on an investment is the expected value of the probability distribution of possible returns it can provide to investors. The return on the investment is an unknown variable that has different values associated with different probabilities. This guide provides the formula and examples for calculating of the future cash flows. 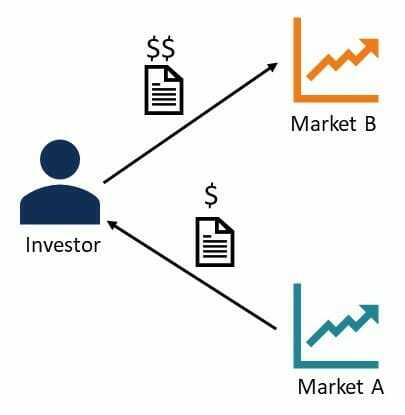 Simultaneous trade execution: The purchase and sale of identical or equivalent assets should be executed simultaneously to capture the price differences. If the transactions are not executed simultaneously, the trade will be exposed to significant risks. Even though this a simple strategy very few – if any – investment funds Mutual FundsA mutual fund is a pool of money collected from many investors for the purpose of investing in stocks, bonds, or other securities. Mutual funds are owned by a group of investors and managed by professionals. Learn about the various types of fund, how they work, and benefits and tradeoffs of investing in themrely solely on such a strategy. This fact can be explained by the difficulties associated with exploiting the commonly short-lived situation. With the rise of electronic trading, which can execute trade orders within a fraction of a second, mispriced asset differences occur for a minuscule amount of time. The improved trading speed has, in this sense, improved the efficiency of markets. In addition, equal assets with different prices generally show a small difference in price, smaller than the transaction costs of an arbitrage trade would be. This effectively negates the arbitrage opportunity. Arbitrage is generally exploited by large financial institutions because it requires significant resources to identify the opportunities and execute the trades. They are often performed with the use of complex financial instruments, such as derivative contracts and other forms of synthetic instruments, to find equivalent assets. Derivative trading frequently involves margin trading and a large amount of cash required to execute the trades. Paintings are alternative assetsAlternative Investment Market (AIM)The Alternative Investment Market (AIM) was launched on 19 June 1995 as a sub-exchange market of the London Stock Exchange (LSE). The market was designed to help small, high-growth companies that are keen on raising capital for expansion. with a subjective value and tend to give rise to arbitrage opportunities. For example, one painter’s paintings might sell cheaply in one country but in another culture, where their painting style is more appreciated, sell for substantially more. An art dealer could arbitrage by buying the paintings where they are cheaper and selling them in the country where they bring a higher price.